10 So they took soot from a furnace and stood before Pharaoh. Moses tossed it into the air, and festering boils broke out on men and animals. 11 The magicians could not stand before Moses because of the boils that were on them and on all the Egyptians. 12 But the Lord hardened Pharaoh’s heart and he would not listen to Moses and Aaron, just as the Lord had said to Moses. The time is not specified in the scriptures. Sunbeams from the right of the picture light this scene, casting shadows off to the left hand side. Moses (throwing soot from a furnace into the air) & Aaron. Pharaoh, sat upon his royal throne, looking very cross! 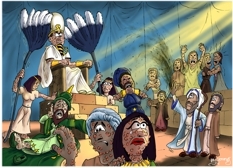 The two slave girls that are fanning Pharaoh & the two magicians are the same characters we met in the plague of gnats cartoon. There are various courtiers & other Egyptians present in this scene. 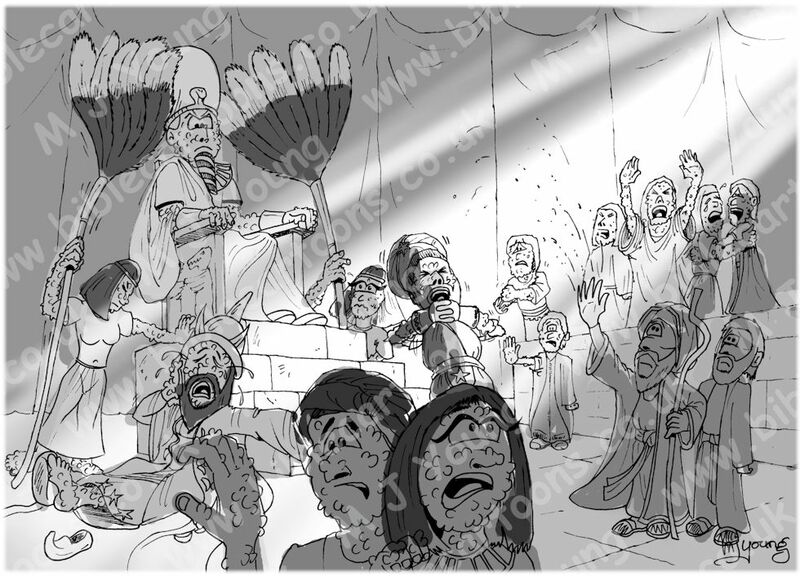 I enjoyed drawing this scene, even though it depicts real suffering of the Egyptian people, which must have been terrible for them. I am particularly pleased with the posture of the left hand slave girl, who is looking down in misery, & accidentally bashing Pharaoh with her ostrich feather fan! For me, she captures the sense of suffering the plague must have caused & her stance really draws my eye towards her. I don’t often have people in close-up, but I felt it was important to show the boils in all their ugly glory, & so elected to draw the suffering couple in the foreground. I’m rather pleased with the way the two magicians came out. The one in green by the steps leading up to Pharaoh’s throne is swooning & has lost his shoe, whilst the other one (in blue) is apparently choking from the soot! Notice what is says in verse 11, ‘The [Egyptian] magicians could not stand before Moses because of the boils that were on them and on all the Egyptians.’ The Egyptians worshipped many gods, among them were Sekhmet, a lion-headed goddess with alleged power over disease; Sunu, the pestilence god; and Isis, goddess of healing. Notice once again that these Egyptian “deities” were unable to prevent the plague of boils… or indeed, any of the other plagues. We can conclude that the Egyptians were badly mistaken to put their faith in “deities” or “gods” who really could not save them. We read in verse 12 that Pharaoh persisted in willful obstinance. That’s why I have shown him looking cross! I think the light rays (sunbeams) coming into the scene from the upper right lift the scene somewhat, & make it more interesting. Perhaps it represents the power of the Hebrew God at work? !